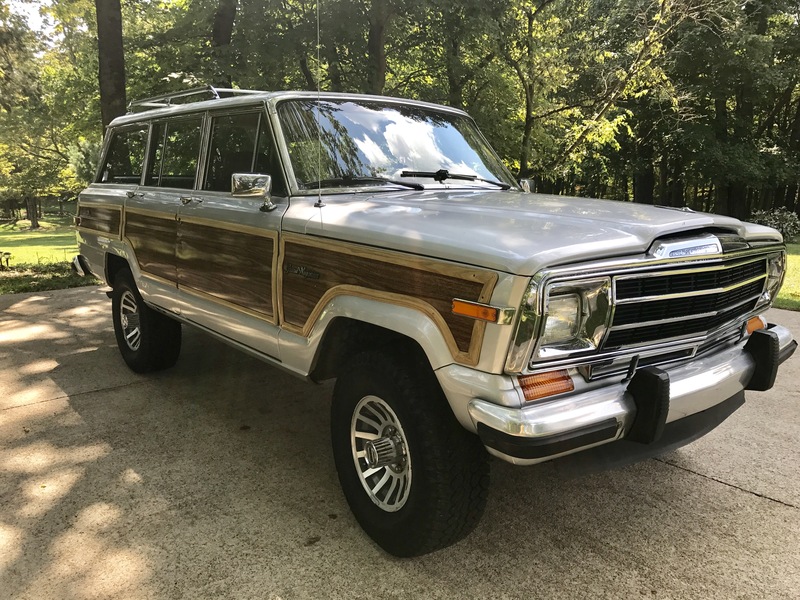 I purchased this Grand Wagoneer last fall. I love it. It is a weekend driver. I don't know anything about cars but I am willing to learn. My overall goal for the Jeep is to get it close to stock. The photos in the album were taken when I got it. I have put in about $1200 of maintenance work and changed the tires to the Hankook Optimo's. I squirrel money away to decide what to do next. I do know that the previous owner put on the Edelbrock intake and carburetor. I would like to fix the exhaust as it is pretty loud in my opinion. I know there is a hole in the Y-pipe. Please take a look at the album and let me know what you think. Weak cranking is when warm usually a sign of a weak starter. Mine does it sometimes. First and foremost, if you plan on keeping it a while, get rid of that rust! The only way to do it right is to have it cut out and patched with good metal. I would also suggest rotating the fuel filter (cylindrical silver thingy on fuel line near the carb) to where the return fitting is on top(fuel line not going directly to carb on two port side of filter). Looks like a mild lift has been installed? I spy blocks on the rear axle and no wag sag. In fact, you have some clearance between the tires and rear fender lip. Looks pretty clean. Welcome to the asylum. Thank you for taking a look. I know it is a little inconvenient to go through the whole album. I snap a ton of photos of the Jeep just so I have something to reference down the road. It does have blocks from the previous owner. I will probably get it to stock height at some point. The rocker panel rust is bad and there are a few spots on the body but overall, I think it isn’t too bad on rust. The Carfax had it as a Texas—Colorado—Alabama until it made its way to KY for the last 8 years or so. I’ve pulled back the carpet as much as I can (I can’t get all the seatbelt bolts out) and the floorboards didn’t have holes in them. I wire wheeled the rust and painted. I think BJ's Offroad has them. I would think theirs is better than a run of the mill parts store's version. Maybe not. I do know they are the source for most things you might need including rocker panels and quarter skins. Welcome to the forum. Before you replace the starter, I think it would be a good idea to check engine timing. If it is too far advanced, you can get symptoms similar to your description. Another sign of timing too far advanced is light to obnoxious pinging under acceleration. I would also verify good wire, connections and grounds for the starter circuit before replacing it.